Some might accuse the South Atlantic League of having an embarrassment of riches. Bryce Harper, Jameson Taillon and Manny Machado should all star in the Sally League in 2011 after being the top three selections in the 2010 Draft. Delino DeShields Jr., whose father played 13 seasons in the Majors, will likely patrol the outfield for Lexington after being selected No. 8 by the Astros, and Yankees catching prospect Gary Sanchez rounds out the list of Top 50 prospects in the South Atlantic, playing for Charleston. The 6-foot-4 left-hander made his debut in short-season ball after being selected in the first round (27th overall) of last year's Draft. He allowed two homers over 43 2/3 innings, with batters collecting a .241 average against. He struck out 41 in 33 1/3 innings in the Gulf Coast League and went 1-0 over three starts in the New York-Penn League. Cole fell to the fourth round primarily because of concerns regarding his price and struggles in his senior year. The Nationals had no concerns however, signing the right-hander for a $2 million bonus. The 19-year-old Cole should start the year with Hagerstown alongside Harper after tossing an inning for Vermont in 2010. DeShields, whose father played 13 years in the Majors, hit well in a brief debut, batting .289 with eight RBIs in 18 games after being selected eighth overall by the Astros and is considered a potential leadoff hitter in the big leagues. The 18-year-old outfielder made headlines this offseason after being busted for drunk driving, but it is not expected to impact his season. The No. 1 pick of the 2010 Draft, Harper has shown an ability to hit in limited action, batting .343 in the Arizona Fall League and .389 in Spring Training. The 6-foot-3 outfielder was selected as MLB.com's No. 3 prospect before even playing a Minor League game. 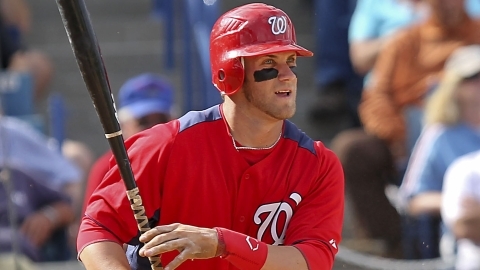 Only 19, Harper is expected to move quickly through the Nationals farm system, making Suns games a hot ticket. Selected two spots after Bryce Harper, Machado made his debut in 2010, batting .306 with a homer and five RBIs in nine games between the Gulf Coast Orioles and Aberdeen. The 18-year-old shortstop hit in all seven games he played for the IronBirds and is MLB.com's No. 24 prospect. Ozuna displayed prodigious power last season, leading the New York-Penn League with 21 homers in 68 games for Jamestown, earning All-Star honors for the Jammers. The 20-year-old outfielder went deep once in a six-game cameo with Greensboro and finished with a career-high 62 RBIs. Profar made his pro debut with Spokane at the age of 17 and handled himself well, batting .250 with 42 runs scored in 63 games. The Curacao native came on strong down the stretch, hitting .284 with three of his four homers in August. Profar made an impression on the big league team in Spring Training with his demeanor in the field. One the Yankees' three highly regarded catching prospects, Sanchez ranked No. 32 on MLB.com's Top 50 list. After torching the Gulf Coast League with an 1.016 OPS, the then 17-year-old backstop was promoted to the New York-Penn League, where he batted .278 with two homers in 16 games for Staten Island. Sanchez also threw out 53 percent of attempted basestealers in his brief time with the Yankees. No. 18 on MLB.com's Top 50 list, Taillon is a hard-throwing 19-year-old from Texas. The 6-foot-6 right-hander will begin the year in extended Spring Training, but should make his pro debut with West Virginia later in the year at the age of 19. Taillon went second overall after striking out 114 batters over 62 2/3 innings as a senior in high school. Yelich, the Marlins' first-rounder, had a solid, if brief, debut, making a six-game cameo for Greensboro. The 6-foot-4 first baseman batted .348 with two doubles and two RBIs with the Grasshoppers after compiling a .375 average in the Gulf Coast League.